Downwinders at Risk is proud to announce Kari Northeim, a doctoral student in Environmental Sciences at the University of North Texas, has agreed to become our Wise County Ozone Project Director. 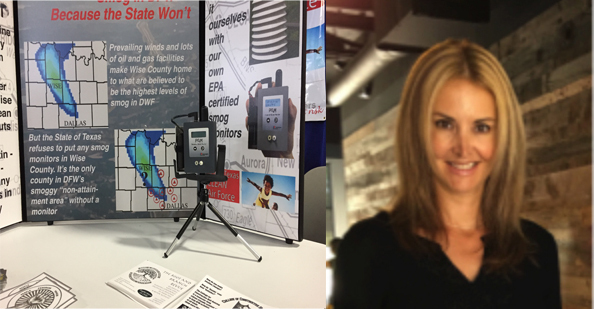 Kari brings an impressive resume and a rigorous level of scientific methodology to the use of our two new EPA-calibrated portable ozone monitors we purchased earlier this year. She has an undergraduate degree in Engineering from Iowa State, has two more years at San Francisco State studying Meteorology, including climate change modeling and global warming research. Still not satisfied, she went and got a Business degree at Syracuse, worked in the private sector for 16 years, went back to teach High School science, and is now pursuing a PhD. in Environmental Science – Biological Sciences with an emphasis on Health Geographical Information Systems. Did we mention Kari has an impressive resume? But it’s more than accumulated degrees. Kari’s father and all of her siblings are engineers, while her mom is a math teacher. Number crunching is in her blood. And she wants to use those mad skills to help the environment and people. So instead of making small fortunes for Wall Street firms or multinationals, she’s helping non-profits do original research in smog pollution. How did we find her? She found us. Following her UNT adviser’s advice to catch the presentations on 21st Century air quality monitoring featured in Downwinders’ series of Evenings of Science and Socializing last June, she drove down to Fort Worth, saw the show, and stayed to talk. It’s a great outreach event when it snags this kind of talent (and courtesy of the Ft. Worth League of Neighborhoods, you have a chance to see a repeat of that Cowtown performance September 7th – see the notice below). 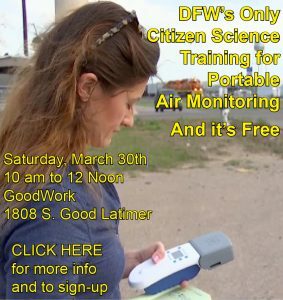 Believed to be the largest, or at least most ambitious citizen-science project in North Texas, Downwinders’ Wise County Ozone Project is going where no state or federal monitoring for smog has gone before: into the only DFW “non-attainment” county without an ozone monitor. Wise County is where fracking was born and the gas industry still dominates many parts of it. It’s also where a lot of everyone else’s smog accumulates. Predominant southeast winds push it from the Gulf Coast all the way to Midlothian, through the metro DFW area, and into Wise County. Based on past computer modeling by the State itself, ozone levels are often predicted to be higher in Wise County than any other 10 DFW non-attainment counties – but there’s still no State monitors there. That gap in local public health information is intentional and it’s that gap the Wise County Ozone Project is filling. Northeim is already drafting plans on how best to put the monitors to the test in the field. She wants us to have the ability to use them as stationary monitoring sites, as well as be able to take them with us on the road. It’s a complex and long-term mission that Northheim says she relishes. And she’ll be putting out the “Help Wanted” sign soon as she recruits other citizen scientists and volunteers to help, so stay tuned. 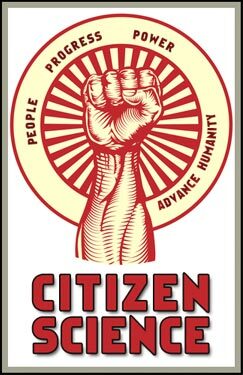 You too can become a citizen scientist for the public interest. Finding Kari was a real coup. 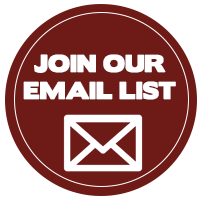 But from its founding, Downwinders has had a long and distinguished history of working with great scientists and using sound science to advance the cause of cleaner air. Dr. Marvin Legator’s 1996 report on the State’s toxicity classification system eventually led to some changes in Austin. Dr. Stuart Batterman did a landmark public health critique of the TXI hazardous waste burning permit in the late 1990’s. Dr. Al Armendarez, an engineering professor at SMU when he started out as Downwinder’s technical adviser, left in 2009 to become the first engineer ever to be appointed as Regional Administrator for EPA. In 2015, Dr. Kuruvilla John of UNT’s Physics Department used that school’s supercomputers to reproduce the state’s air modeling for DFW outside of Austin for the first time so elected officials could see what impact new pollution controls would have. Soon-to-be Dr. Kari Northeim is the latest effort by Downwinders to develop local DFW expertise to help solve DFW air pollution problems. Please join us in welcoming her to the cause and consider signing-on to what is sure to be another historic challenge to the Status Quo. Previous post: Why Cement Kilns are Insatiable. And Why You Care.